A normal goose or duck liver is usually small and not significant to a chef or a gourmet. Foie Gras, on the other hand, is a treasured specialty. In this post, I provide insight into “Foie gras de canard” (duck) and “Foie gras d’oie” (goose). Many people associate Foie Gras with French cuisine. Not surprisingly. Today France is by far the largest producer and consumer of foie gras. However, the technique of gavage dates as far back as 2500 BC. We now know that the ancient Egyptians began keeping birds for food and deliberately fattened the birds through force-feeding. This practice quickly spread through the Mediterranean, first being adopted by the Greek and then the Romans. During the Renaissance, Louis XIV was known for enjoying foie gras and this delicacy began to trickle down from royal courts to the French middle class. French farmers soon learned that fatty duck liver is also very delicious, with an added bonus: ducks are more reliable in laying eggs than the geese, and they are also easier to raise, eat less, and are typically slaughtered earlier than geese. In short: raising ducks is easier and less expensive than geese. Foie gras made with duck liver is significantly less expensive than foie gras made with goose liver. If you see a restaurant offering you “pan-fried foie gras” and “pâté de foie gras” or, as the English speaking would say, “foie gras pâté“, it is almost certain that you are served duck liver instead of goose liver. But what ever fatty liver, if it is well prepared, they both taste delicious. 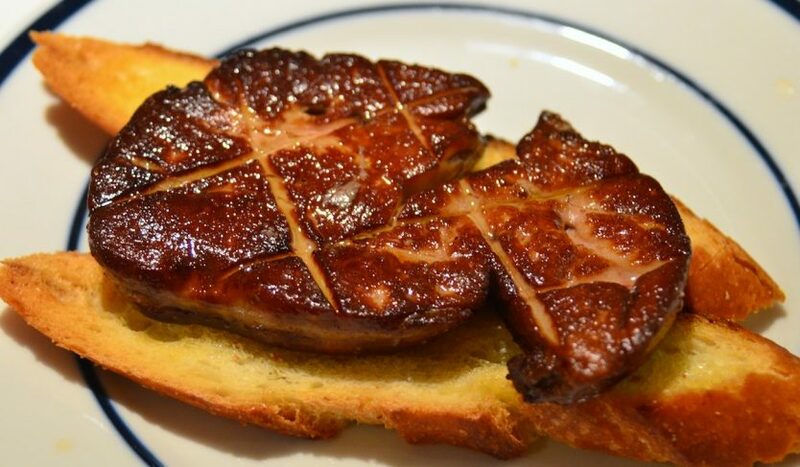 How can you tell the Difference between Duck and Goose Foie Gras? Duck liver is darker than the one of a goose, which is pale. The diameter cut of the center of a goose liver yields a rounder shape than the one of the duck liver, which looks like a half moon shape. Pan-fried goose liver is firmer than pan-fried duck liver. Duck liver has a more distinguished “poultry liver taste” than goose liver, which tastes milder and a bit sweeter and creamier. The loss of fat after frying a duck liver is higher than with goose liver. In the mood for genuine goose liver? We will be happy to serve you the best. See our menu.